IKOMA JOURNEY - The tourist guide of Ikoma City, Nara Prefecture, Japan. 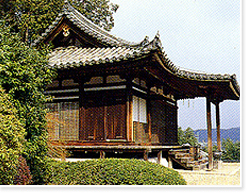 According to temple records, Enpukuji Temple was constructed in the years between 749 and 757 by the High Priest Gyoki and is the ancient temple of the Shingon sect. the main hall, said to be of early Muromachi period architecture, has been designated an important cultural property. The appearance provides an aura of elegant simplicity.